I don't know about you, but I sometimes need a bit (okay, a whole lot) of cheering up... And endorphins never fail. I dare you to start off a run as the grumpy Grinch and not feel better afterwards - trust me, it's impossible. Quite clearly on an endorphin high. Runners make me love running even more. Somehow we all just get each other - you know what I'm saying? 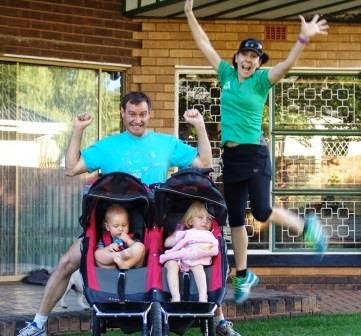 In a culturally diverse country like South Africa, I haven't seen many things as effective as running in truly uniting people from all cultures and walks of life - I love it. Oh, the temptation. And don't think that it's only the expensive, shiny stuff that makes us smile - no. Even a humble pair of running socks has the power to turn a grown runner into a grinning goofball. Man, gear and gadgets make us happy. I may not be the fastest or sleekest runner, but running makes me strong and healthy, and it allows me to keep up with my kids. And having fun with my kids makes me pretty darn happy. So thanks, running. Every run is an adventure: It can be a simple tale of a horrendous start that morphed into an epic runner's high right in your own neighbourhood; or it can be a visit to an exotic country for a bucket-list destination race. Running takes you places, and boy, oh boy, I'm enjoying the ride! Thanks to the lovely ladies from Eat Pray Run DC, You Signed up for What? 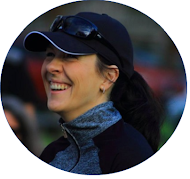 and Mar on the Run for the opportunity to share the reasons why running makes me happy as part of their Friday Five link-up! I understand be excited over the little things. Until I started running I never thought I get excited over a pair of socks. Now I do..lol! 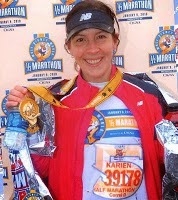 Running makes me happy and for all the reasons you mentioned! Great list. Love listing adventure. Good choice! Definitely agree with it. Thanks, John! Definitely one of my favourite things about running. Great pics, the first is priceless! N° 6: the pics of the races. They are always wonderful memories. I love race and running pics too, Stefano - great for looking at when you can't run or when your next running adventure is still too far away! All of these things make me happy! Even if a run doesn't go as planned, I'm always happier at the end. I get so frustrated with myself for forgetting that, Lisa... I KNOW going for a run will make me feel better, but sometimes I still have to drag myself by the ears...! I totally agree with your list. I found a pair of Feetures socks this week for $3 (normally $14). You'd thought I'd won the lottery! everything about running makes me happy! Especially the alone time. Love that you have gadgets and gear on this list! Great list.